Peoples’ Self-Help Housing President & CEO John Fowler (far right) and Caitlin Cox, a representative from U.S. 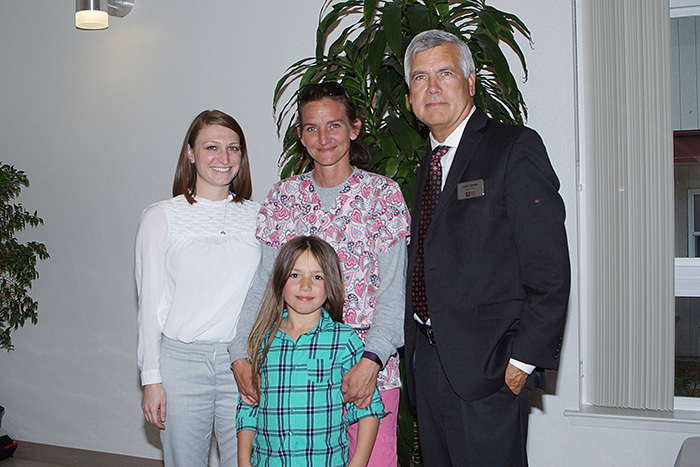 Congressman Salud Carbajal’s office (far left), stand with Rolling Hills II applicant Mindi Kay Andio and her daughter. Construction of the new Rolling Hills II complex is scheduled for completion this summer. Templeton, Calif., April 26, 2018 – Peoples’ Self-Help Housing (PSHH) received more than 400 pre-applications for its new 30-unit Rolling Hills II affordable housing development in Templeton, CA. A lottery ceremony held April 19 to determine the processing order of the applications saw more than 50 interested applicants and community members in attendance. Caitlin Cox, a representative from U.S. Congressman Salud Carbajal’s office, was on-hand to assist in pulling names at random from the lottery drum. Taking turns selecting names during the one-hour ceremony was President & CEO John Fowler, Chief Operating Officer Joe Thompson, Director of Administration Annette Montoya and Portfolio Manager Mike Brown. Expected to be completed this summer, Rolling Hills II, located off Las Tablas Road, will add 30 one- to three-bedroom apartments to the existing Rolling Hills Apartments. Four units are ADA-accessible and all downstairs units are adaptable. The new construction also includes laundry facilities, a barbecue area and tot lot. Residents at both developments are able to share existing community facilities. Rolling Hills II will serve households earning up to 60 percent of the area median income with rents based on bedroom count and unit size. Pre-applicants will be notified by May 7 of their lottery number and any necessary further steps; after this date, pre-applicants not notified or those with questions may contact property management directly at rha2@pshhc.org or (805) 462-0762. Applications received after the deadline were automatically placed on a waitlist.